They need to do something.... but if they refuse, then I guess it's time to do it myself then. 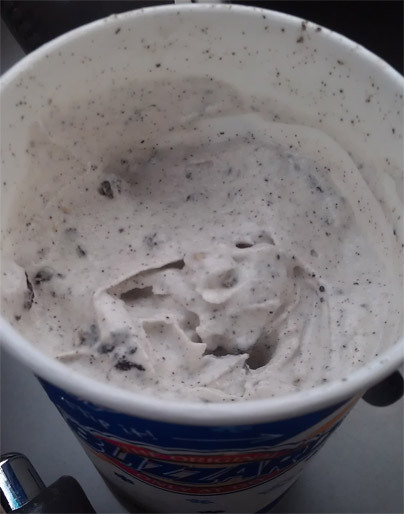 This is an Oreo Cookie Dough Blizzard. 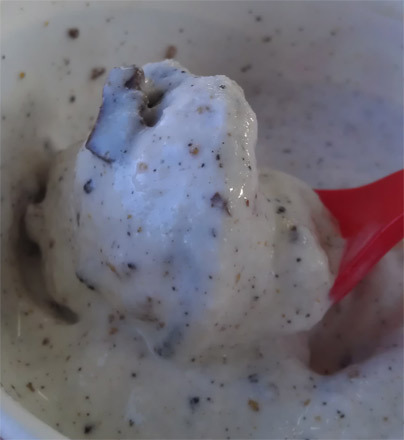 It mixes the lovely crunch and flavor of the Oreo blizzard with the nice textural changes of cookie dough bits. The downside here is that there's not really any cookie dough flavor happening. The Oreo side wins on this one. This is an Reese's Oreo Blizzard and oh did I have high hopes for this one. I was envisioning something along the lines of the new peanut butter Oreos, but unfortunately Reese's have such a unique flavor that they totally overtake this treat. Oh, it was still tasty, and I got a nice chunk of Oreo now and then, but the Oreo flavor is totally lost. Reese's wins this battle. Note: the employee tempted me with a second 99 cent blizzard (a la the current DQ commercials), but I'm just not man enough to handle 2 blizzards in one lunch time (though I will admit, I was tempted to have two minis). B1G1-99 lasts through September 23rd. So with the battle of the double mix-ins currently tied at one to one, feel free to chime in with any combos you think I should go for before the month is over. Sure we've had the Oreo Cookie Jar Blizzard, Mint Oreo Blizzard, Oreo Brownie Blizzard, and even the Strawberry Golden Oreo Blizzard, but what would you create when you are limited to what's currently on the menu? hi. i would make mine some sort of coffee & chocolate flavored blizzard with lots of oreos in it. that sounds like it would be good. thank you.